Any rubber covered contact drum or pinch roll will show wear after time. When contact drums become damaged or worn, it may be necessary to have them reground and possibly rebalanced. If there is more than 1/8” damage or wear in the rubber, the rubber covered drum (contact drum) my need to be removed from the machine and recovered, ground and balanced. We recommend dressing your rubber covered contact drums at least once a year in a high production environment. Your rubber covered contact drums will go through heat cycles, causing the durometer of the rubber covering to change and eventually harden. This could create finishing issues on your product. It is critical the rubber covered drum (contact drum) is ground concentric to the journals at the location where the bearings are located. High speed rubber covered drums (contact drums) should be rebalanced as close to operating RPM as possible. Dynamic balancing is recommended. 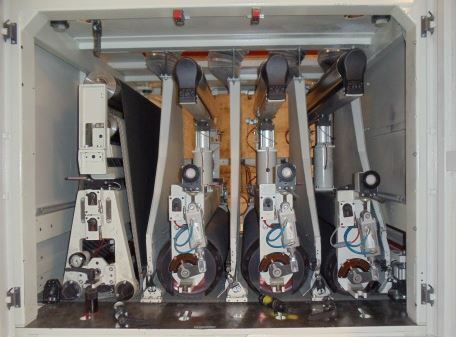 In most cases, rubber covered contact drums can be “kiss” ground while being left in the machine. If your rubber covered drum (contact drum) is producing a slight machine chatter, this may be the best method of eliminating any effects of drum and/or bearing run out. It is extremely important to ensure the rubber covered drum (contact drum) be level to the conveyor belt and/or conveyor bed plate so as to not grind a taper into the drum face which will cause abrasive belt tracking issues such as folding or creasing. Sanders Unlimited has designed a device to dress/kiss grind your rubber covered contact drum without removing it from your machine saving you labor costs. Contact us today to schedule a service call and have your drums dressed/kiss ground.